This amiable Welshman became a Saint in the summer of 1962. He was signed from Aberavon RU club after completing a rare Championship winning season with them and gaining three Welsh international caps. Kel regularly featured at the top of the game’s goalkicking charts, thanks to his meticulous method and constant practice. Kel’s boot and smart forward play helped the Saints to defeat Leeds and Wigan successive Championship Finals in 1970 and 1971. 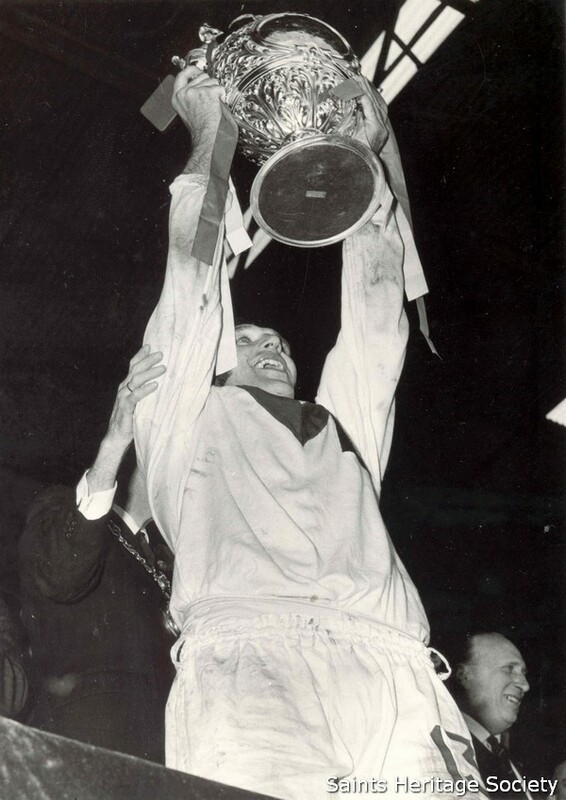 In the latter it was down to Kel Coslett to lift the Championship Trophy aloft - a manoeuvre he was set to repeat several times over the next six years! Kel became club captain for the 1971-2 season and in the 1972 Challenge Cup Final the Saints took on a powerful Leeds outfit. Kel played a marvellous game in the loose - directing the team and holding out the lethal Leeds attack. 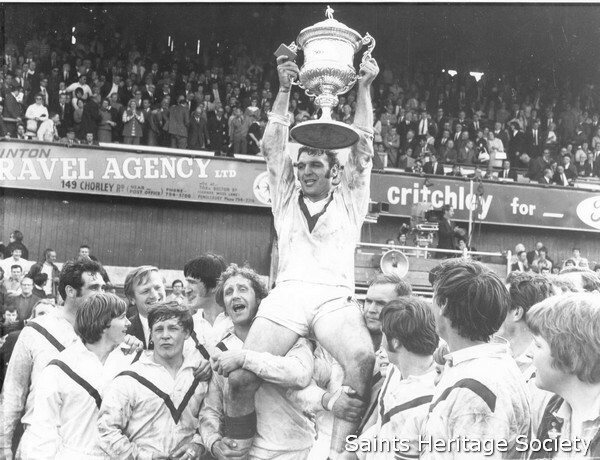 His five goals haul in the Final, included a magnificent 30 yards drop goal that soared ten yards above the uprights, always kept Saints in the lead throughout the match. This great all round performance brought Kel the Lance Todd Trophy as the man of the match. In total, Coslett played an incredible 54 matches that season scoring 8 tries and kicking 214 goals for an unbelievable tally of 452 points. The goals produced the game`s third best total of all time. Kel`s final season in a Saints` jersey more than lived up to the town`s expectations. Coslett captained the side for the fifth successive season and many pundits had written off the "old codgers" at the start of the campaign. Few outside St Helens fancied their chances as Saints were paired against Widnes in the 1976 Challenge Cup Final. 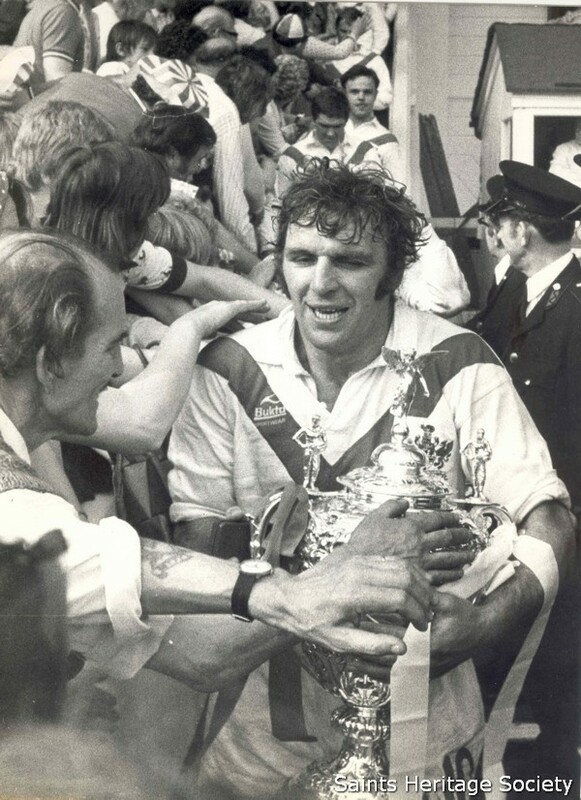 The press had labelled the Saints as `Dads Army` but as the Final unfolded it was the Saints pack, led by Coslett who battered Widnes into submission and presented Kel with the honour of receiving the cup for the second time. On the international scene Kel gained 12 caps for his native Wales. Kel Coslett has played more matches than any other player in Saints` jersey. He has also kicked more goals and scored more points than any other Saint - some 1409 ahead of Paul Loughlin. These records could well stand the test of time as will the name of Kel Coslett in rugby league folklore! It is indeed also fitting that he became the President of our famous club.